This is a small sized scale model with “big” performance. The Saab B17 is not equipped with landing gear and it is easily hand thrown. Having a little more wing- and stabilizer area than the Safir, it has almost ideal proportions for a flying scale model. The B17 has a scale contour and if you add some extra details it can be built to a very accurate model of the full size. The Saab B17 is Saabs first design and it first took to air in 1940. The aircraft was used as dive bomber and as a reconaissance aircraft designated S17. 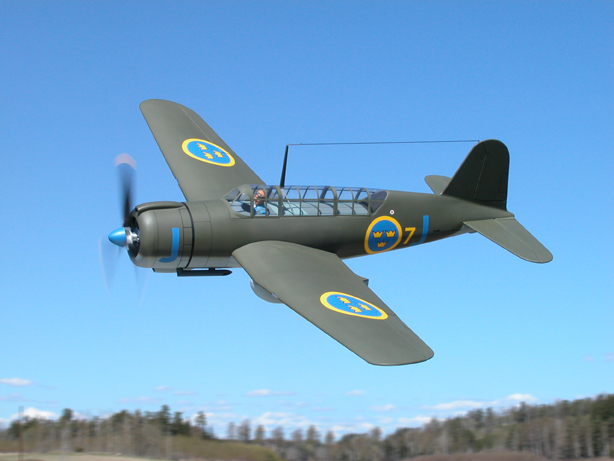 The S17 was also used in a marine version with floats called S17BS.The total production of Saab B17 was 322 aircraft and it was used by the Swedish Air Force during 1942- 1954. Today only one B17 is maintained in flying condition around the world – The Swedish Air Force Museum “Blå Johan”. It is kept airworthy by a group of enthusiasts and it is flown regularly at air shows in Sweden. The B17 was used by other countries Air Forces e.g Ethiopia and Denmark who both used this classic Saab design.